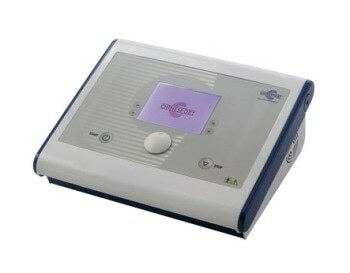 The Magnet Therapy equipment called MAGNETO 4 allows to control all four output channels independently. For specific uses, more channels can be enabled sequentially at the operator’s discretion. A SYNC configuration is also available that allows to enable all four channels simultaneously. A harmful event like a trauma, can cause a depolarisation of protein structures and reduce the trans-membranous electric potential of the cell. The micro-currents induced by the magnetic therapy repolarise the biopolymers, re-establishing the correct electric potential, accelerating ionic movement, and re-integrating tissue functions. All control functions and the whole operational lay out of the unit are controlled and co-ordinated by a microprocessor: this allows access to the stored application programs, and ensures optimal and safe use of the equipment as decided by the operator. The user interface is a large, backlit, clear liquid crystal graphic display (LCD): the display shows all operational messages, the state of the unit during normal therapeutic operation, and any error messages.